Description: The X40 Series controllers provide an extensive list of Input and Output capabilities that allow for use in almost any control system integration design. Standard outputs include Common Alarm Relays and Modbus Interface. 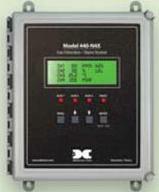 Optional Outputs include 4-20 mA, Webserver Interface, and an Alarm Voting Module. The RS-232 port is standard and is used for uploading configuration data or downloading Data Logging results.